My husband often brings home DVDs of 'interesting' films from our local library. My initial reaction, when we sit to watch them on a Saturday or Sunday night, is to look with deep (and utmost) distrust at the synopsis and presume that I wouldn't want to watch this particular film because it is 'too violent' or 'too depressing' or 'too...'. Inevitably, I not only end up watching the film, I also end up liking, well, at least 90% of these films. My reaction to Das Leben der Anderen was slightly different - my husband said it was more in the nature of a 'thriller' (well, in his defence, the DVD said so). I was definitely in the mood for a well-made thriller, and it didn't mean anything that I hadn't heard of this film before. So we put it on. Well, once again, my initial presumptions were wrong - this film certainly wasn't a 'thriller' in the accepted sense of the word. Equally certainly, however, it was thrilling. In the erstwhile German Democratic Republic [GDR] in 1984, Glasnost is nowhere in sight. East Berliners are kept under strict surveillance by the Stasi (Staatssicherheit, or 'State Security'), the secret police of East Germany. 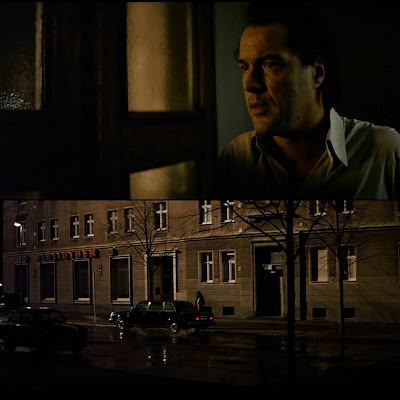 So begins this taut tale of 'the lives of others' as seen through the eyes of an officer of the dreaded Stasi, Hauptmann Gerd Wiesler (Ulrich Mühe). The film begins in the Stasi's temporary detention centre. Hautpmann Wiesler is interrogating a man suspected of helping his friend escape to the West. The prisoner is referred to only by number: Prisoner 227. 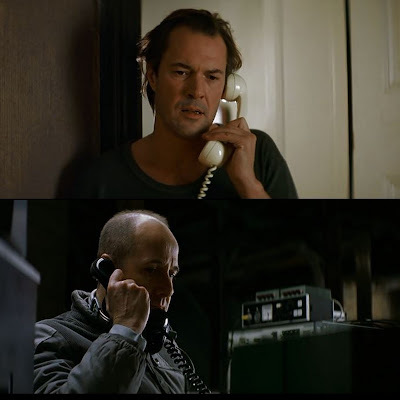 These scenes intersperse with Wiesler's lectures to a new batch of potential recruits, where he shows them the videos of the interrogation, and lectures them on how to detect when a suspect is lying. By the time class ends, Wiesler has a visitor. It's his old classmate Anton Grubitz (Ulrich Tukur); he invites Wiesler to the theatre that evening. Minister Hempf is going to be present, and as the head of the culture department, Grubitz should show his face there. Georg Dreyman (Sebastian Koch), a famous playwright, is putting on his latest play, and it stars his girlfriend, Christa-Marie Seiland (Martina Gedeck). Wiesler is sure that Dreyman, an 'arrogant type', is not as clean as he looks. No, Grubitz assures him, Dreyman's clean, and besides, Minister Hempf likes him - they would be shooting themselves in the foot if they tried to monitor him. But when Grubitz meets the Minister (Thomas Thieme) after the play ends, he's in for a surprise. It appears that the Minister would like to have Dreyman monitored. In fact, he is quite sure that Dreyman is not as loyal as he seems. Perhaps Grubitz could have his flat wired? Meanwhile, Grubitz had informed Wiesler of the Minister's expressed desire, and the next morning sees Wiesler outside Dreyman's flat, keeping tabs on Dreyman's and Christa-Maria's schedules. A day later, as soon as the two of them leave the flat, Wiesler moves the Stasi in. They have 20 minutes in which to wire the apartment. Synchronising watches, Wiesler leaves his men to do their job, while he searches Dreyman's flat and the empty space above it on the top floor. Dreyman has gone to meet Albert Jerska (Volkmar Kleinert). Dreyman has hopes that the Minister will do something to help them. Jerska has no ambitions to direct any more - all he wants now, he says, is to die -- and be born again as an author; a happy author, who can write what he wants. Back at the flat, Christa is busy decorating their flat for Dreyman's 40th birthday. Upstairs, in the bleak attic, the Stasi has already set up the recording equipment and the close-circuit camera. Wiesler is upstairs, headphones in place. Not even a whispered conversation in the flat below can escape his ears. Herr Jerska has come to the party after all. So has Paul Hauser (Hans-Uwe Bauer), and Karl Wallner (Matthais Brenner), all friends of Dreyman's. Hauser is an impassioned supporter of freedom. You cannot afford to be such an idealist, he tells Dreyman. It's conformists and informers who destroyed Albert Jerska. If you can't take a stand, you're not human. He leaves the party, but not before telling Dreyman to contact him if he's ready to take action; if not, he needn't bother to contact Hauser ever again. When the party is over, Dreyman opens his gifts, and finds one from Jerska - a piece of music called 'A Sonata For A Good Man'. Upstairs, Wiesler is noting all this down, typing up his reports. Dreyman is code-named Lazlo while Christa is CMS. Twelve hours later, Wiesler is relieved by another Stasi officer - Seargeant Udo Leye, who will take over for the next 12 hours. 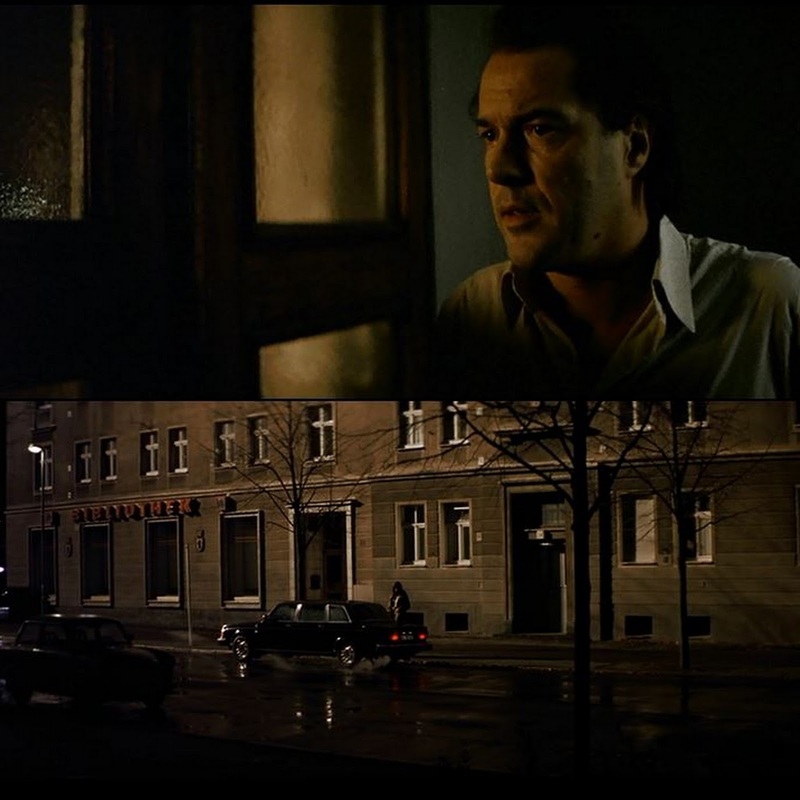 Wiesler goes to meet Grubitz at the Stasi cafeteria. There, the latter gives him some critical information; the car that dropped Christa-Maria home the day before they began surveillance, the one that Wiesler wanted checked, was that of Minister Hempf's. Grubitz has struck any reference to the car from Wiesler's reports. They can't monitor top Party officials. Basically, what they're doing, says Grubitz, is helping one top official get his rival out of the way. Wiesler takes leave of Grubitz and is back at his surveillance spot in the grim attic. Dreyman is already home, and Christa is on her way back. She is accosted by Minister Hempf who reminds her that she'd forgotten their assignment that Tuesday. It is clear that she is his mistress, and has been for some time, even if she loves Dreyman and he loves her. It's clearer still that she's repulsed by Hempf, and indeed, is afraid of him. When Wiesler sees the Minister's car on his close-circuit camera, however, he decides to take a hand. He despises having to do the Minister's personal work, and decides to queer the Minister's pitch by letting Dreyman know of his girlfriend's perfidy. He causes the outer doorbell to ring incessantly, which makes Dreyman go down cursing to open the front door to the building. While he overhears the Minister's final (ominous) message to Christa, he says nothing to her. The next day, Christa has some unfortunate news for Dreyman - Paul Hauser has been refused a permit for his lectures in the West. 'Are you surprised,' Dreyman asks her. 'If he acts so arrogantly, he should expect it. 'Would you let him go if you were in their position?' And up the stairs, Udo is faithfully recording every word that they speak. The afternoon brings Dreyman even worse news - Wallner phones to tell him that Jerska hanged himself. A shaken Dreyman hangs up, and sits at the piano to play The Sonata of A Good Man, the music that Jerska had presented him. And upstairs Wiesler is listening. Meanwhile, the Minister is getting impatient. 'Find something,' he commands Grubitz. Implicit in his conversation is a veiled threat. Grubitz passes on the message to Wiesler, making the threat more explicit. Back at the flat, Dreyman is suffering from a writer's block; ever since Jerska committed suicide, he's been unable to write. He tells Christa that he's only scared of two things now - of being alone, and of losing her. Christa, who is on her way to meet the Minister, reassures him; in response, Dreyman tells her he knows all. He implores her not to go. She doesn't need the Minister, he tells her; if she has no faith in her talent, at least have faith in him? Christa doesn't deny anything. But she cannot buck the system. Neither can Dreyman, she tells him. Doesn't he conform at their behest? Because they can destroy him, despite his talent, and his faith. 'They' decide who will write what, who will act, who will direct. She doesn't want to end up like Jerska, she tells him, so she will go now. Wiesler who has been listening, responds to the anguish in both Dreyman's and Christa's voice. Slowly, he decides not to mention the Minister at all in his report, recording instead, Christa's given excuse of meeting an old classmate. When he is relieved by Udo, he stops for a drink at a neighbouring pub, where he runs into Christa, who comes in for a drink to calm her nerves. Impulsively, Wiesler accosts her; their conversation persuades Christa to go back to the flat where an ecstatic Dreyman welcomes her back. It is to be a turning point for Dreyman as well. After Jerska's funeral, Dreyman gets the idea for an article - a subversive article on the unaccounted suicides in East Germany as a sort of an obituary for his friend, Albert Jerska. 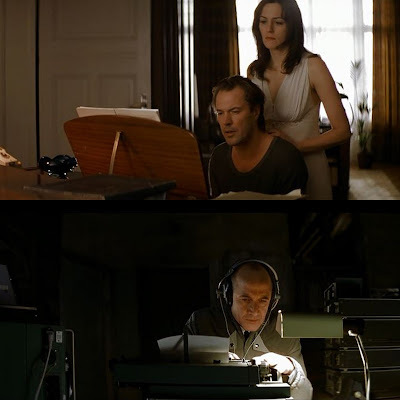 He goes to meet Hauser, who informs him that he, Hauser, had foolishly rehearsed his speech for the West in his flat, and since then, he's turned musical - an oblique reference to Hauser's flat being tapped. Dreyman is certain that his flat is clean, but Hauser is careful. They will meet at the Pankow Memorial; amused at all this cloak-and-dagger stuff, Dreyman hands over his article to a pleasantly surprised Hauser. Dreyman wants Hauser to help him publish it in the West. Hauser promises to help - as long as Dreyman doesn't tell Christa about it. He will get in touch with Gregor Hessenstein, an editor at Der Speigel, but warns Dreyman not to publish under his own name, unless he wants to be interrogated for the next 48 hours. Not fun, he says laconically. They need a safe place to wait, however, and Dreyman offers his flat. He's a national award-winning writer, a personal friend of Margot Honecker; why would State Security doubt him? Hauser, already bitten, is cautious. If only they could be sure? He has a plan; they will use the help of his uncle Frank, who visits every Saturday from West Berlin. An elaborate ruse is planned. One that makes Wiesler, listening overhead, make a hard choice, one that will have consequences - only, not the ones he thinks. As Onkle Frank calls with the good news, the conspirators are gleeful. And Wiesler is baffled - only for a moment, though. Dreyman and Wallner cannot help but gloat over how they had 'put one over' the Stasi, whom Dreyman stigmatises as 'incompetent'. Wiesler is furious. 'Just you wait,' he mutters under his breath, since he had helped them. Surprisingly, however, he doesn't put the incident into his written report. The next morning, when Wiesler comes in to take his shift, Udo wants him to listen to something important - there are men talking downstairs; they are discussing the slant of Dreyman's article, and Udo believes that there's something sinister afoot. Wiesler is listening intently; Hessenstein wants Dreyman to write something about the social conditions that cause the suicides, and when Hauser speaks up, Wiesler realises that Hauser is not in the West, after all. Thinking quickly, he tells Udo that Dreyman and Hauser are only collaborating on a play (the excuse that Dreyman thought up earlier). Udo is not convinced, but Wiesler brushes off his qualms, cursorily telling him not to try to be an intellectual. Dreyman might think the State Security is composed of idiots, but Hessenstein has a great respect for them. The Stasi is not to be trifled with, he warns Dreyman. To that end, he's even brought Dreyman a present. The Stasi can identify the typeface of any typewriter registered in East Germany, Hessenstein warns Dreyman. If the text of his article is intercepted at the border, he will spend the rest of his life in Hohenschönhausen*. Hessenstein also wants him to hide the typewriter when not in use. He doesn't, he says, want his next article to be about Dreyman's disappearance. As they toast to Dreyman's success, and to showing all of Germany the real face of the German Democratic Republic, a furious Wiesler begins typing up his report. In his hands is the weapon that will destroy Georg Dreyman, and along with him, Paul Hauser and Wallner as well. 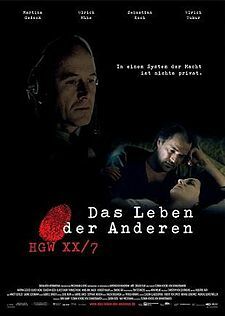 Set in 1984, Das Leben der Anderen is debutant director Florian Henckel von Donnersmarck's interpretation of the repressive East German regime that sought to control its citizens by keeping them under strict surveillance. So pernicious was this surveillance that neighbours reported on neighbours, friends informed on friends, and family betrayed their own so they would be spared the wrath of the Stasi. The Ministerium für Staatssicherheit, as the Stasi were officially known, had taken the place of the Gestapo and was, allegedly, far worse than its predecessors. By 1984, the film tells us, the Stasi numbered 100,000 employees and 200,000 informers, all of whom they kept in check with threats and bribes. In stark scenes which never sacrifice their tension for emotions, von Donnersmarck lays bare a dark period in Germany's recent history - and though never having lived in East Germany himself, and indeed being only a boy of 16 when the Berlin Wall fell - focuses on its grim totalitarian regime as it once existed. Not only that, he points, with pinpoint precision, just how a police state can manipulate and exploit its citizens, skewering their vulnerabilities and forcing them to make choices that they know are morally deficit. One of the most chilling scenes in the film does not have anything to do with either Dreyman or Christa. Or even Wiesler. It is an exchange between Grubitz and an unfortunate Lieutenant who, not knowing that Grubitz and Wiesler are sitting at the next table (the bosses usually sit elsewhere; they are there only because Wiesler insists that socialism has to begin somewhere) begins to tell a joke about Honecker**; when he becomes aware of their presence, he stops, frightened. However, Grubitz encourages him to continue. When the joke is told, Grubitz laughs along with the young lieutenant, but soon composes himself, and says, 'Name? Rank? Department?' A visibly frightened officer tells him he is Lieutenant Alex Steigler, Department M. Then, after warning him that deriding the party means the end of his career, Grubitz laughs. He tells the young officer that he was just kidding. Unfortunately, as we learn towards the end of the movie, Grubitz was kidding - when he said he 'was kidding'. Another scene is where they finally break Christa-Maria, played with an odd mixture of authority and vulnerability by Martina Gedeck. Christa-Maria is arrested because she finally plucks up courage to reject Minister Hempf's advances. 'I never want to see her on a German stage again,' he froths, and Grubitz, ever ready to curry favour, takes her interrogation into his own hands. Knowing what's in store for her, she promises Grubitz anything, anything, if he would only let her go. Eventually, that 'anything' is to turn informer. Her career is her life, and even though she's an acclaimed actress, Christa-Maria is very insecure about her career. It's Dreyman who props up her fragile self-esteem, and it is he who she will betray in order to keep her career, and her life. He, who she will betray, not once, but twice. Yet, how do you fault her? In the world in which she lived, where the State depended on fear and betrayal for survival and power, how was she, or anyone else, to withstand the pressure? Who are we to judge, who have never known what it is to live under such fear? Oberstleutnant Anton Grubitz, played by Ulrich Tukur, is an interesting character. He's a man who's attained his position by cheating in his exams - he copied from Wiesler throughout their years of study. Yet, today, he's an Oberstleutnant (Lieutenant Colonel) in the Stasi, while Wiesler is only a Hauptmann (Captain). Grubitz may pay lip service to the motto of the Stasi - The sword and shield of the Party - but he knows how to play the game. As he reminds Wiesler, life is not about grades, but success. Nowhere is it clearer than when he picks up on Minister Hempf's implied suggestion that he find something to incriminate Dreyman. Or when he eventually realises that the Minister is just using the Stasi to get rid of Dreyman: When Wiesler questions him about their oath to the Party, Grubitz is nonchalant - what's the Party if not its members? And the more influential the members are, the more it means for their careers, his and Wiesler's. Yet, he too, is not completely black. One doesn't quite know why, and nothing is said explicitly, but it is clear that Grubitz suspects Wiesler of having removed the one piece of evidence that would have destroyed Dreyman. He has no proof, of course, but when did the Stasi need proof? Yet, he lets Wiesler leave, with the bleak statement, 'Your career's over.' Is that because he felt an obligation to the man whose work he copied? Or because, if he informed on Wiesler, he would be compromising himself as well? Or is it because, in his own way, there's was a sense of friendship that prevents him from throwing Wiesler to the wolves? Some sense of obligation at having used Wiesler to pass his exams all those years ago? Acting honours got to Ulrich Mühe, who plays Hauptmann Gerd Wiesler with such subtle restraint. The Captain is a loyal party supporter, living alone in a drab apartment. He's the sort of man you fear, his stern professionalism and discipline turning him into a robot who actually believes in the State. 'To imply that our humanistic system would persecute an innocent man,' he tells his class, 'is itself grounds for arrest.' When Grubitz informs him that the surveillance of Dreyman is only to help Minister Hempf get rid of a potential rival, Wiesler is disgusted. 'Is it for this we joined?' he asks Grubitz. Wiesler cannot confide in anyone. The very nature of his job means that he doesn't trust anybody. It is a very isolating life, one that is underlined in the scene where he asks a prostitute with whom he has a brief encounter, if she can stay awhile. It is only when he begins his surveillance of Dreyman that he begins to be drawn into a life that he has never known - a life where there is friendship, camaraderie, love, an intimate relationship, laughter and poetry and music. It is Dreyman who introduces him to The Sonata of a Good Man, a piece of music that brings Wiesler to tears. As Dreyman comments to Christa-Maria, 'Can anyone who has heard this music, truly heard this music, really be a bad person?' It is in searching Dreyman's apartment that Wiesler discovers Bertolt Brecht; he lies alone in his drab flat and reads - and is touched by - Brecht's Erinnerung an die Marie A. (Reminiscence of Marie A.). As the dedicated Captain who believes in the State and the Party ('We're the sword and the shield of the Party. '), to the man who is gradually brought to disillusionment when he realises that Party officials misuse the state machinery to take revenge on their enemies, to his eventual redemption even as his own star falls, Mühe traverses the gamut between tight, controlled reserve to the thawing of his defences as he continues to spy on a man suspected of dissidence. The sympathy that he begins to feel for Dreyman, while suspect (since, as Stasi, he would have been trained out of it), is made very believable by Mühe, and Wiesler continues to be drawn into Dreyman's life as he sits in the attic of Dreyman's building day after day, listening, spying, recording. Slowly, he he discovers that his duty as a party officer is at odds with his duty as a good communist. Mühe plays his part with restraint, allowing only his eyes to show the depth and subtlety of emotions that he's beginning to feel at his core. It's an amazing performance, one that evokes in us an unwilling sympathy with a seemingly cold-hearted machine, whose only job is to ensure that no one rises up against the State. He keeps us guessing, his actions not predictable at all, and at least one of them, leading to consequences that even he could not have predicted. In sharp contrast to Wiesler is Dreyman - handsome, confident, disarming, and much to Wiesler's consternation, a man who appears to believe in socialism. Even in private. It's confounding. As Grubitz puts it, 'He's our only non-subversive writer who's read in the West. He thinks GDR is the best country on earth.' It's almost too good to be true. Dreyman is almost naïve in his steadfast refusal to believe the worst of his country. Even when his mentor is blacklisted, he approaches the Minister hoping to have Herr Jerska pardoned. He even believes Hempf when the latter assures him that Jerska can certainly hope to direct again, when the latter is only cleverly playing on the meaning of 'hope'. He loves Christa, and even when he's 'informed' by Wiesler that she's betraying him, is not furious with her. He knows the reason why, and he can forgive her. His idealism only takes a beating when Jerska commits suicide; it is then that he begins to question what he knows of the State. He's at the crossroads of patriotism and justice. There is no middle way. Das Leben der Anderen is both a political commentary and a human drama, and we are drawn to sympathise, even empathise, with these two disparate characters who drive the plot. It is the tale of two men - in their own ways, fervently loyal to the Party - and the tale of their disillusionment, and the disparate ways they deal with it. It's the story of how one man influences the other's thinking, not by proselytising but just by being himself. It is the story of how the other man, changing without knowing how or why, puts his own life and career at stake to protect the first - without telling him. 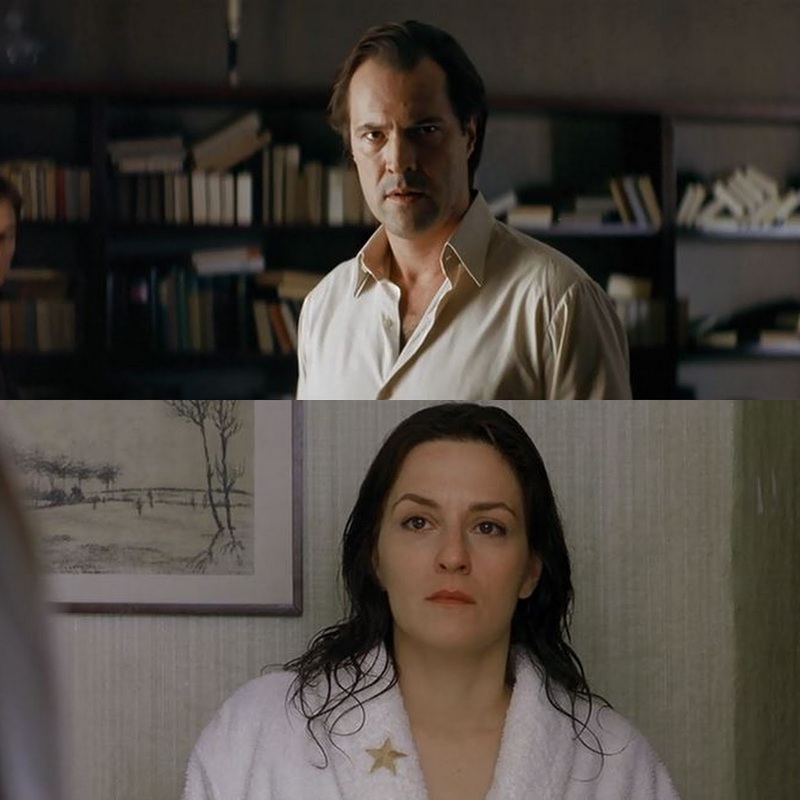 Despite that plot hole however, the film, winning a well-deserved Academy Award for Best Foreign Langage Film (2006), is worth watching, retaining its suspense until the very end. Where it varies from the usual 'suspense thriller' is that it has two climaxes. One where betrayal meets a bloody end on a grey, drab street as befitting a political thriller, and two, where it unexpectedly meanders nearly six and a half years into the future - past the fall of the Berlin Wall and the end of the German Democratic Republic as the world knew it - into a very simple end that spells the death of fear, and the birth of hope. As Wiesler says simply, 'Es ist für mich'. Yes, indeed it is. For him, and for others like him. *Hohenschönhausen was then the Stasi prison, and is now the site of the official Stasi Museum and Memorial. **Erich Honecker, who was the Chairman of the National Defence Council of East Germany, Chairman of the State Council of the German Democratic Republic, and General Secretary of the Central Committee of the Socialist Unity Party - all posts that he held until a few weeks before the fall of Berlin Wall.